The Memorial Candle Program has been designed to help offset the costs associated with the hosting this Tribute Website in perpetuity. Through the lighting of a memorial candle, your thoughtful gesture will be recorded in the Book of Memories and the proceeds will go directly towards helping ensure that the family and friends of William Gargan can continue to memorialize, re-visit, interact with each other and enhance this tribute for future generations. 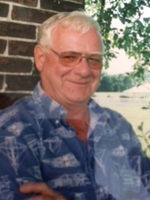 William (Bill) J. Gargan, a lifelong resident of Dalton, MA, passed away peacefully at his home in Woodbury, CT on his 83rd birthday, August, 15, 2018. Bill was born in Becket, MA, son of Edward and Catherine (Galliher) Gargan. He is survived by his wife, Gail Gargan and 4 children, David (Liz) Gargan, Lori Griffin, Shawn (Demarie) Gargan, Kelly Gargan; 2 step-sons, Brian (Elisa) Rosenhein, Bruce (Jackie) Rosenhein; 22 grandchildren and 17 great-grandchildren. He was predeceased by his daughter, Sharon; his brothers Henry and Edward and sisters, Florence Gargan and Patricia Wilander. Bill was employed over 30 years at Central Berkshire Regional School District at Kittredge School and as Head Custodian at Wahconah Regional High School. Bill Proudly served in the Marine Corps for 4 years obtaining rank of sergeant in the Military Police. He also served in the Marine Corps Reserve for 4 additional years. Bill will Be remembered for his sense of humor and practical jokes, love of Irish music, the Red Sox and his beautiful yard at his Dalton home. He enjoyed spending time with his grandchildren, attending their various events. A well known baseball pitcher in his youth, he coached Little League and Babe Ruth league for several years. Bill was an avid Walker, often accompanied by his dog, Molly. In retirement, He enjoyed taking cruises, trips to Vegas, and frequent trips to beaches at Cape Cod with his wife and friends. He was a member of the Pitch League for many years at Wahconah Country Club. He was a member of the former Grace Episcopal Church in Dalton. The family would like to thank the staff at Bright Star, and especially Sheneka, Bill's primary caregiver, for their care and compassion during Bill's illness. Thank you also to Vitas Hospice. FUNERAL NOTICE: Funeral services for Mr. Gargan will be held, TUESDAY, August 21, 2018 at 12:00pm at DERY FUNERAL HOME, 54 Bradford Street, Pittsfield. Calling hours will precede the service from 11:00am-12:00pm. Burial will follow in Fairview Cemetery. In lieu of flowers, donations may be made to the Friends of the Dalton Council of Aging, Inc in care of the funeral home. To send flowers to the family of William "Bill" Gargan, please visit our Heartfelt Sympathies Store.